These are GORGEOUS! LOVING the bunny!!!!!!! Loooove this!!! 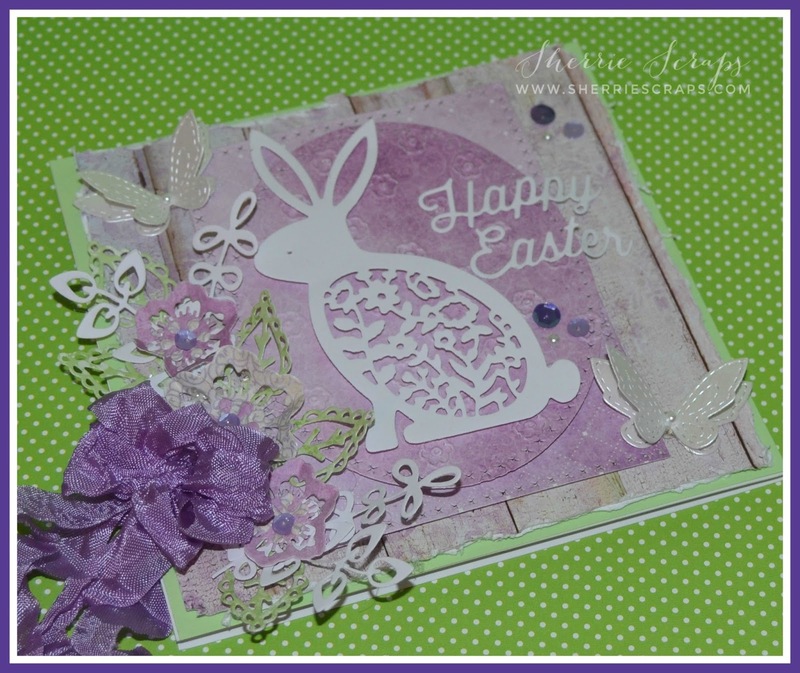 What a wonderful Easter card set Sherrie! Absolutely beautiful. 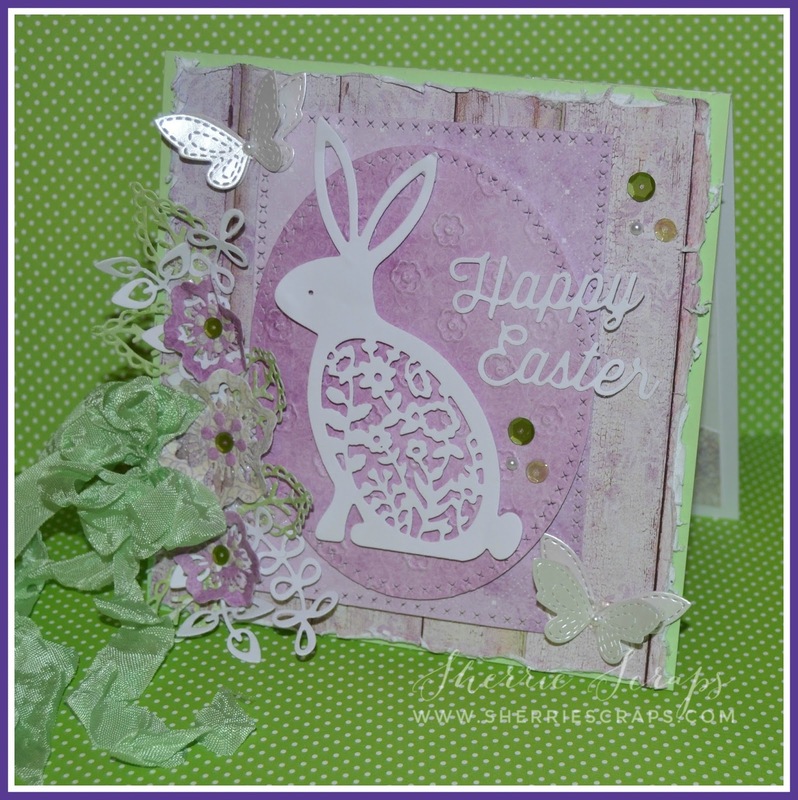 Love the soft colors, the distressed look and that cute bunny. Perfect Easter card my friend. Both of your Easter cards are gorgeous. Love the papers and the shimmery butterflies are a perfect addition. These Easter cards are beautiful! I love that bunny die, just adorable! The papers you used are gorgeous! This is just amazing. Love the colors and all the little finishing touches. You have a great eye for detail. Oh my goodness, these are so gorgeous, Sherrie!! I love the sweet bunnies!! The layers and flowers are so beautiful!! I see several dies I need!! You've used the papers so perfectly (and thank you so much for the sweet shout out!!)!! I love, love these, my dear friend!! They are so stunning!! Adorable cards! 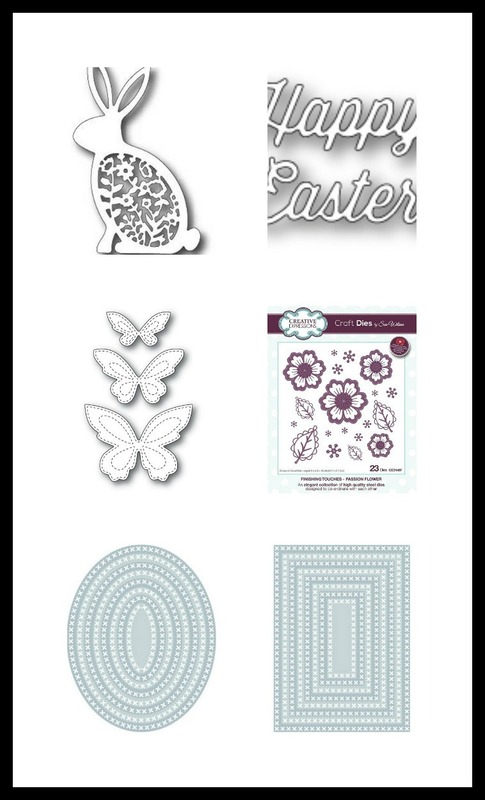 The Easter bunny with the filigree design is gorgeous! The flowers are so pretty and I adore the color combination you used! Oh my goodness, this card is so lovely. EEK! I just LOVE these cards - that bunny is adorable! So so so pretty!! 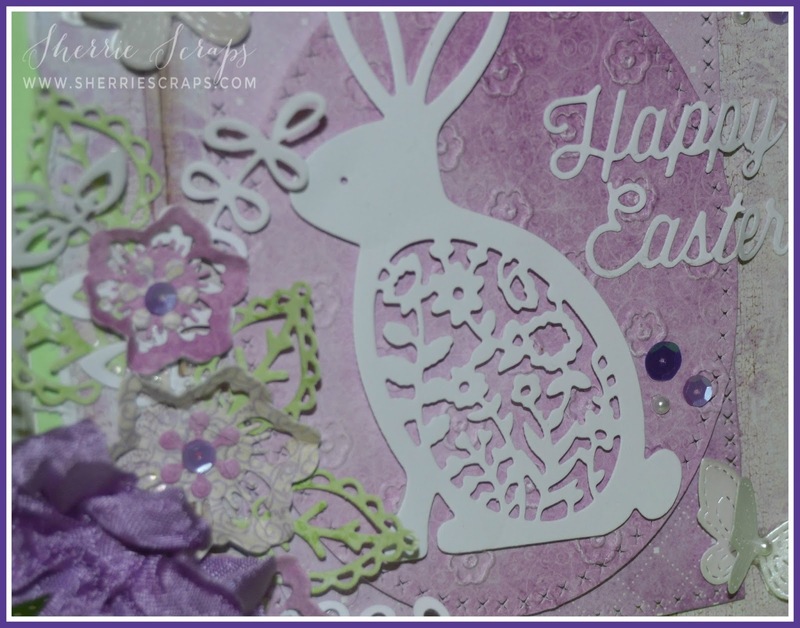 The papers are the perfect choice for Easter and I adore that bunny! This is such a lovely Easter card Sherrie! Thank you so much for your comment on my Facebook page, it was greatly appreciated at this difficult time. So sweet, love the lavender! WOW Sherrie! Your cards are so BEAUTIFUL! I LOVE that gorgeous detailed Easter Bunny die... it's stunning with that lovely Ribbon and pretty Spring colors... Fabulous cards! Fabulous Easter card ! Love this little bunny ! Sherrie, your cards just scream SPRING! The colors are so fresh and I love the combination. Your bunnies are so adorable layered on those gorgeous papers. 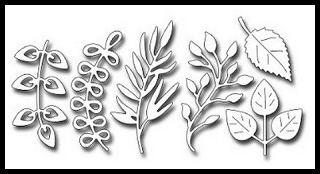 Embossing the stitched oval is such a clever idea, and your floral arrangement is a stunning display! Love these cards! Hugs! Beautiful Easter cards Sherrie! Love the sweet bunny and the soft colors! Beautiful! Oh I love your beautiful Easter card! 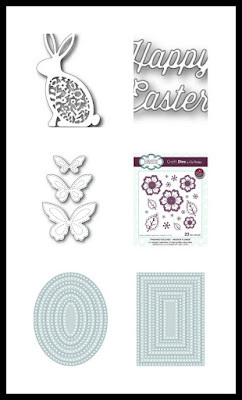 That bunny die is so sweet and the papers are gorgeous! I love how the ribbon goes so well with the paper! I love your beautiful Easter card! Love both your sweet Easter cards! Both your cards are gorgeous Sherrie, love the bunny, flowers and every detail! I love the foliage & leaves and I love that dies bias tape to match your card - So awesome! 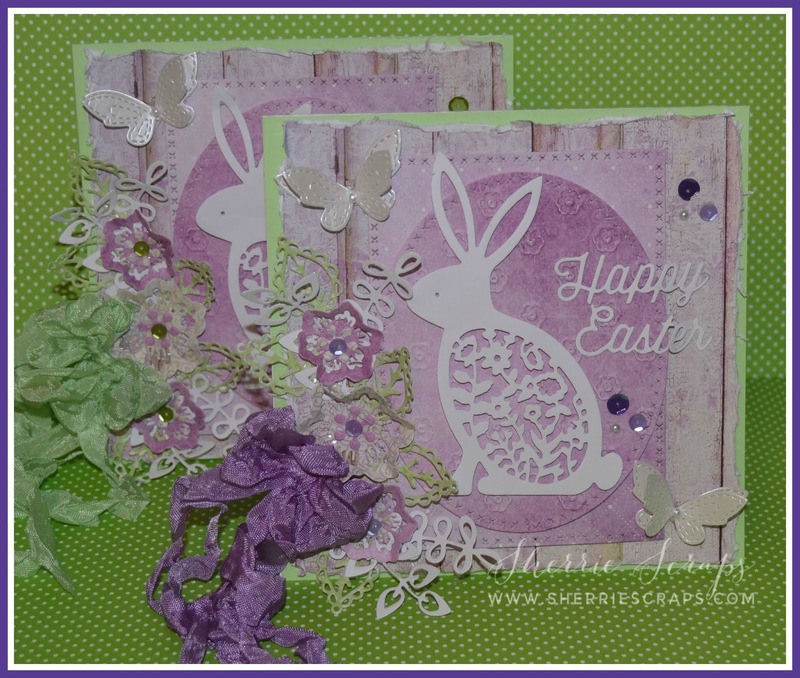 These Easter cards are gorgeous, Sherrie!! Love the pretty colors and the sweet little bunny!!! Love all the details!!! Have a great day. 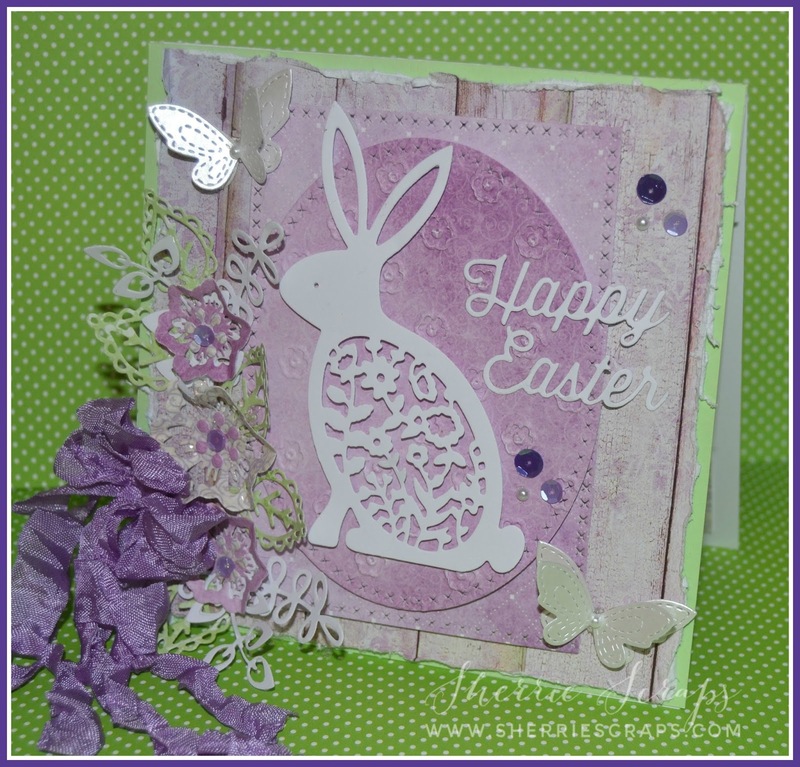 Such a gorgeous Easter card Sherrie! 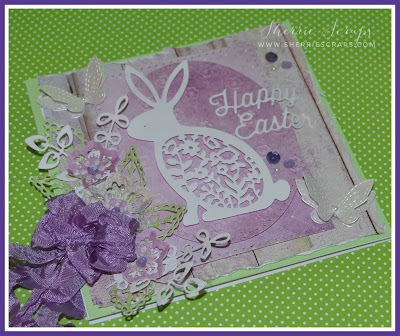 I love the papers you used and that bunny die is beautiful! 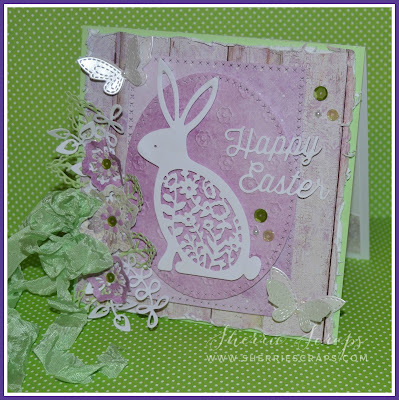 Beautiful Easter card Sherrie! Love the color combination and the lovely paper! That bunny die is just adorable! Oh, wow, amazing! I LOVE that cascade of flowers and trim! Makes me feel like I'm out in a spring garden, and that is so welcome after all the grey gloom we are having lately. That rabbit is fabulous, too, and I love the dimension of the butterflies! Fantastic! Such beautiful Easter cards!! I really love the bunny die and the pretty color palette!